A mid-40 inch muskie found dead on Lake Minnetonka during the hot water time period. In the sport of muskie fishing there are two things that don't mix. Hot water temperatures and big fish. As an avidly obsessive muskie angler, I find nothing more gut wrenching than to come across my favorite fish floating on the surface. Sadly, this has been an all too common occurance as of late. My home waters in the metro have reached surface temps in the 80's. A number that I have vowed as being too high to fish. I have put the big rods away, and until things cool down, they won't come back out. As a fellow musky fisherman, I am asking for you to do the same. I know that there are no laws being broken and I have no right to do this, but I ask this anyway. In a growing sport that has more anglers than fish, I think it is only fair for us to consider the resource before our very needs. The fact that my livelihood has been put on hold and I have cancelled all of my muskie guide trips until it cools down should tell you where I stand on this issue. If we think that we have no effect on the overall resource of our lakes, then we are wrong. The truth is that we are recycling the fish with proper catch and release, and the current water conditions are making this a tough task to correctly do. Here are a few things to consider when it comes to hot water and muskie fishing. A muskie will battle to death when they are hooked. This is no secret. Having a good gameplan ensures that they are quickly put in the net, unhooked, measured and released before they fight too long. When a muskie goes into battle they give it their all. Similar to a human going from a resting position to running a 2 mile sprint. Consider this anaology in that at the end of the 2 mile sprint, someone dunks your head under the water for 45 seconds. While this might seem dramatic, it might be a fair comparison to what takes place when we battle a muskie. Now consider doing this exercise in extremely hot temperatures. I think you get my point. Some other things to consider is the oxygen level in hot water. I'm not a biologist, but research has shown that oxygen levels decrease as the temperature rises. When we catch a muskie, they need time to recover. This usually occurs boatside and on the surface, which is the hottest water in the lake, with the least amount of oxygen. During a battle, muskies build up lactic acid in their bodies, and if the conditions don't allow them to appropriately recover it ends in death. The hardest fact to consider in this equation is that it doesn't always occur immediately. 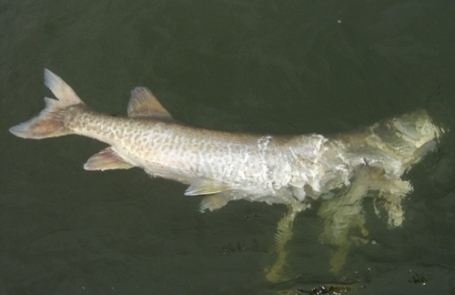 Studies have shown that muskies caught in hot water have been released only to die days later. A sad fate for a fish that we cherish. While I have put an end to my muskie fishing until the temps drop, there are some things to consider if you still plan on fishing. First, plan your trips during cooler periods. Night fishing can cool the surface slightly. If you do choose to fish for muskies, come extra prepared and know exactly what you will do once a fish is hooked. Time is of the essence. Limit the amount of time you handle the fish. A dozen pictures with your trophy will likely result in a dead trophy - even if you watch it swim away. If you must take a pic in hot water, then a shot of the fish in the water is the best choice. Leaving the fish in the water is by far the best option. Next, fish with a friend. I don't want to step on any toes here, but if you plan on fishing solo, I would strongly encourage you to wait a few weeks until it cools down. Another set of hands can make a huge difference in getting the fish back in the water and on its way to a speedy release. Plus, if a picture is what you are after, trying to do it solo is a tough chore with a struggling fish. This should apply all year long, but especially now - once you catch and release a fish, wait around for a while to make sure the fish is doing okay. I can't tell you how many times I have seen fish swim away and resurface a short while later. They need time to recover and we owe it to the fish to make sure they get back on track. Lastly, become an educator. If you are a musky fisherman that has the opportunity to be an influence on your friends or other anglers, then you should take the time and be the difference. Become a positive mentor for another angler who simply might not know right from wrong or proper techniques. You would be surprised at how a few technques and ideas can positively influence an angler that has never handled a 35, 40 or even 50 inch fish. Positive encouragement goes a long way to preserve our resources. On a positive note, this can be the best time of the year to head north. All reports and personal experiences have indicated a good bite happening on big time muskie lakes up north. I'm not saying you need to spend a bunch of money on travel, but lets be honest here. A tank of gas is the same as 2 muskie lures and we all have way too many of them in our box to let money get in the way of our passion. Whatever your plan, please consider that we are responsible for the state of our muskie fishing. I am just one of the many muskie addicts that have taken the stance to wait until the water cools down. I think I speak for many when I ask for you to do the same. Besides, the wait will be over before we know it and the fishing will only get better. Until the temps cool, catch a bass, a bluegill or a catfish, just keep on livin' your dream! Cool Temps - Hot Muskies!